Scientists have engineered a virus which may help addicts battle cocaine addiction. Researchers have already developed proteins that can reduce the effect of cocaine - but it has proved difficult to slip them past the body's defences. The new approach uses a virus to bypass these defences, and produce the proteins where they have most effect. The work, by the US Scripps Research Institute, is published in Proceedings of the National Academy of Sciences. The researchers injected the virus - known as a phage - into rats' noses twice a day for three days. On the fourth day, the rats received a shot of cocaine. The cocaine appeared to have less effect on the animals who received the virus injections than on those who did not. 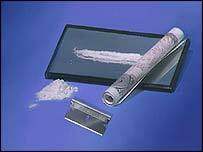 They showed less signs of behaviour typically associated with exposure to cocaine, such as sniffing and raising themselves on to their hind legs. The researchers believe their work provides evidence that the virus can successfully penetrate the defences protecting the rats' nervous system, and begin to produce proteins to counter cocaine where they will have the maximum effect. The proteins are designed to either to bind to cocaine to block its effect, or to change its chemical makeup, reducing its mind-altering ability. The study also suggested that the phage could be repeatedly injected without any apparent side effects. Writing in the journal, the researchers say: "We have shown a promising strategy in the continuing effort to find effective treatments for cocaine addiction. "Whereas previous protein-based treatments have relied on peripheral drug-protein interactions, our approach delivers the therapeutic protein agent directly into the central nervous system, the site of drug action." Professor Janda said the same approach could also be considered for other addictive substances, such as nicotine. A spokesperson for the charity DrugScope said: "Recent developments in the addiction treatment field are very interesting, but we have to be realistic about how much they can achieve when used in isolation. "Dependent drug users often have experienced a range of social and psychological problems which contribute to their addiction, and these factors must also be addressed if rehabilitation is to be successful. "If not, the user may simply move onto other drugs to help them cope with these underlying problems." Lesley King-Lewis, of Action on Addiction, said: "It is important to remember that cocaine addiction is very difficult to treat. "This is just one potential form of support for an addict and unlikely to be very successful if used in isolation. "Other forms of help would also be necessary for cocaine addicts giving up, as it is more than just the physiological addiction that causes people to use again. "Craving is a very complex issue that won't necessarily be solved with this type of intervention."